Doro PhoneEasy 626 is a comfortable cell phone for seniors who have problems to hear, read or deal with regular cell phones available in the market. Doro is a leader company in easy to use cell phones for seniors, As Doro PhoneEasy cell phones, the phone is designed to be easier to use for seniors as well as anyone who struggle with technology. Doro PhoneEasy 626 include features to help the users in emergency situations like the emergency SOS buttons, which can be easily activated calling for help. 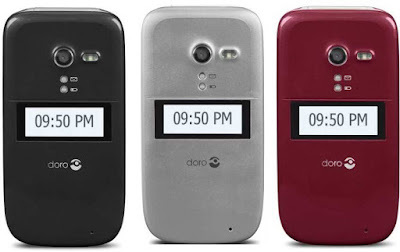 Doro PhoneEasy 626 is a simple flip cell phone, built to offer a comfortable user experience. It has a big well spaced keypad buttons, clear to read colorful screen displaying large text and numbers that makes it easy to read by seniors who have a problem to read small fonts. 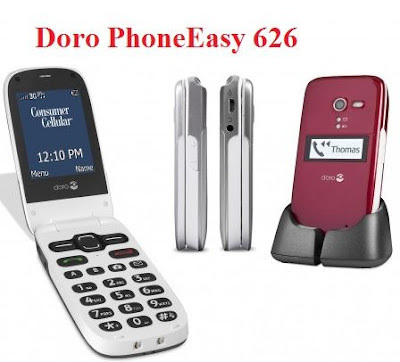 Doro PhoneEasy 626 has a loud speaker which produces clear audio, for seniors who have hearing problems, this cell phone is made to be hearing aid compatible. Doro PhoneEasy 626 supports Bluetooth, now you can make and receive calls with hands free. The easy to use 2 mega pixel camera comes with a flash and allows you to take and send photos and video messages. The phone also has an external display to show notifications, FM Radio, flashlight. When a cell phone is marketed to seniors, it is recommended to have safety features, the Doro PhoneEasy 626 comes with a more helpful emergency SOS button that can be easily programmed to call for help, also speed dial buttons feature is available. Big Sale:Buy best cell phones for seniors . Colorful display with big text and numbers. Support Bluetooth for hands free use. Built in 2 mega pixel Camera with flash, video recording capabilities. Supports up to 32 GB MicroSD card. Up to 6 hours talk time battery life. Doro PhoneEasy 626 is available through Consumer Cellular which is a Mobile Virtual Network Operator that uses AT&T network. Consumer Cellular is a company that caters the seniors market needs, so it used to offer a set of Doro phoneEasy cell phones, at the time of witting this article Doro PhoneEasy 626 is offered by Consumer Cellular with any monthly plan which, start as little as $10 per month. Check out the Consumer Cellular phones for seniors. You can check the Consumer Cellular Anywhere plans. Doro PhoneEasy 626 is available in three colors black, burgundy and silver. Doro PhoneEasy 626 is highly recommended, since it is built to be easy to use cell phone for seniors, that makes seniors feel more secure because it has many safety features.